This is one of the more amazing things I have read of late. Environmentalist recants his opposition to GMOs. Good, I hope Greenpeace is listening and will reconsider its absurd and destructive opposition to golden rice. As an environmentalist, and someone who believes that everyone in this world has a right to a healthy and nutritious diet of their choosing, I could not have chosen a more counter-productive path. I now regret it completely. So I did some reading. And I discovered that one by one my cherished beliefs about GM turned out to be little more than green urban myths. I’d assumed that it would increase the use of chemicals. It turned out that pest-resistant cotton and maize needed less insecticide. I’d assumed that GM benefited only the big companies. It turned out that billions of dollars of benefits were accruing to farmers needing fewer inputs. I’d assumed that Terminator Technology was robbing farmers of the right to save seed. It turned out that hybrids did that long ago, and that Terminator never happened. I’d assumed that no-one wanted GM. Actually what happened was that Bt cotton was pirated into India and roundup ready soya into Brazil because farmers were so eager to use them. I’d assumed that GM was dangerous. It turned out that it was safer and more precise than conventional breeding using mutagenesis for example; GM just moves a couple of genes, whereas conventional breeding mucks about with the entire genome in a trial and error way. Bravo Mr Lynas. It is hard to admit one was wrong. It is even harder, though, for a man like Lynas to declare himself on the "wrong" side of a "progressive" issue like this. He has now likely put himself into a category along with black Republicans who will incur special wrath and disdain from progressives. Speaking of the need for a little science in the environmental movement, I was channel surfing over Bill Moyer's show yesterday on PBS (actually I was navigating to our local PBS station to make sure Downton Abbey was set to record later in the day) when I heard Moyer whip out a stat that even with a carbon tax, the world will warm over 6 degrees this century. Now, I don't know if he was talking in degrees F or C, but in either case, a 6 degree number far outstrips the climate sensitivity numbers used even by the IPCC, which many of us skeptics believe has exaggerated warming estimates. It is constantly frustrating to be treated as an enemy of science by those who display such a casual contempt for it, while at the same time fetishizing it. US$ 2 billion over the following decade. multiplying it by Missouri's projected annual consumption. report's authors, Justin P. Hauke and David Stokes. meaning that Missourians will be filling their tanks more often. When both of these factors are taken into account, the ethanol blending mandates are shown to be costing Missourians about US$ 118 million per year. report obtained by the Guardian. internationally-respected economist at global financial body. greenhouse gases and reduce their dependence on imported oil. sparked financial speculation in grains, driving prices up higher. The report points out biofuels derived from sugarcane, which Brazil specializes in, have not had such a dramatic impact. All this stuff was known long before Congress voted for the most recent ethanol mandates. Why is it that the media, who cheerled such mandates for years, is able to apply any institutional skepticism only after the mandates have become law? Are we going to have to actually pass some awful version of carbon trading before anyone will consider its inherent problems? attributed to a demand for, well, sun. restrictions on building, did not enjoy the same population growth. All of this tends to suggest that people don't value sunshine quite as much as is supposed. I have pretty convincing anecdotal evidence that the first part, at least, is true. I worked for a large manufacturing corporation called Emerson Electric (no relation to the electronics company). They are one of the few Fortune 50 companies not at all coy to admit that they move factories around the world chasing lower wages. They had an epiphany decades ago, when in their planning, they assumed the move overseas was always a trade-off of wages for productivity... until they visited at motor plant in Brazil that had first world automation and productivity combined with third world wages. That got their attention. To their credit, they have pushed this further and further, such that not only are their factory workers in Mexico, but their plant superintendents and skilled workers and even their engineers are now Mexican too. Anyway, if you listen to the company tell this story, phase 1 of the story was not a move to Mexico or Asia but to the south. They must have moved probably 50 manufacturing plants over a decade from the northeast to the south during the sixties and seventies. This constant movement seems to be a natural life-cycle of locations as they grow wealthy. Poorer regions eagerly welcome newcomers who may bring jobs and prosperity. But, once the prosperity is there, the prosperous in town begin using government and other institutions to try to lock in their gains. Corporations use government to fight new competitors. Wealthy homeowners pass zoning to keep home prices high and rising. Unions tend to increase and lock in gains for current workers at the expense of new workers. A kind of culture of hostility emerges to any new job that makes less than $54,000 a year, any house that costs less than $400,000, and any immigrant who doesn't have a pale face. Time, not always my favorite publication, hit on a couple of points I have made recently in an article called the Clean Energy Scam. This article has been around for a few weeks but I am only just now getting to it. The rest of the article is quite good. I don't like to criticize where other people choose to spend their charitable dollars, but it is just amazing to me that environmentally-concerned people could give $300 million to Al Gore just to squander on advertising. (By the way, Al Gore claims to have not only invented the Internet, but to have "saved" corn ethanol from government defunding). I think about how much $300 million could have achieve in private land trusts trying to buy up and preserve the Amazon, and I could cry. But all I can do is plug along and give what I can. I donate to both the Nature Conservancy and World Land Trust. biofuels as a response to global warming. feedstocks such as switchgrass "” become a prized commodity. global warming," concludes the study published in Science magazine. 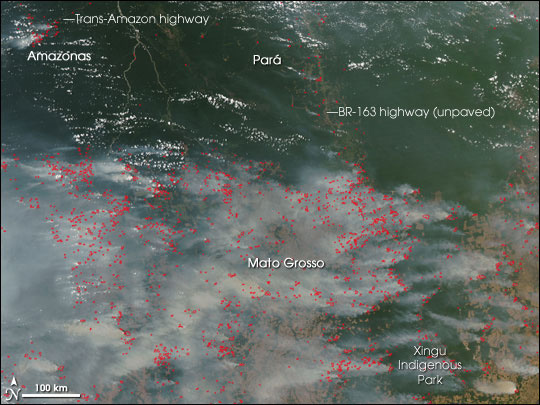 I know that correlation is not equal to causation, but the fact is that this land clearing, which has always one on, really accelerated after the Brazilian ethanol mandates and subsidies. My prediction is that careful academic work in the coming years will pin the blame for a lot of the destruction of the Amazon on ethanol. Not much comment necessary for the following, except to say that I don't think one should be able to call this an unintended consequence of US biofuel and corn subsidies when 1) the results are utterly predictable and 2) folks like myself publicly predicted it. farmers are shifting to corn to qualify for the government subsidies. Since 2006, US corn production rose 19% while soy farming fell by 15%. serious impact on the Amazon rainforest and tropical savannas. especially in the main soy-producing states in Brazil," said Laurance. the 83rd percentile). So, next time the MSM is under attack from the blogosphere, rather than address the issues, they can say that that guy in Tennessee is just a college professor and isn't even a licensed journalist. acts of collecting and distributing makes these people "journalists." surgeon" or someone who can read a law book is a "citizen lawyer." journalistic standards is called gossip. ruining people's lives or for causing grief, suicide or even murder. differentiate between real news and opinions being costumed as news. thinks we should pursue this? Who thinks the entire idea is ridiculous? Its good we are taking lessons on free speech and the media from Indonesia and Brazil. I probably should not make fun of the typos and grammar errors in this post by a "media student" since I make such mistakes all the time. Of course, I am not a "licensed journalist." This is not a new issue. In the early 1980's, the US vigorously resisted attempts by the UN to implement a variety of euphemisms that boiled down to licensing requirements for international journalists. smiled on its people "until now" for a long time, until they didn't. theory simply fail to make any sense if a negative growth rate occurs. impact but can target it. out of fuel, that we'll think of something? So there it is, in the third paragraph, with no danger of misinterpretation. These folks want economic decline. That's a fancy way of saying "We want you poorer." I could spend weeks writing about the fallacies and anti-human philosophy embedded in these four paragraphs, but here are just a few reactions. Every generation has people, like Mr. Tobis, who scream that we are all living in a petri dish and this is the generation we run out of Agar. Of course they are always wrong. Why? Well, first, the prime driver of economic growth is not resources but the human mind. And the world of ideas has no capacity limits. This is an issue that Julian Simon wrote about so clearly. Tobis is trying to apply physical models to wealth creation, and they just don't apply. (and by the way, ask the passengers of TWA flight 800 if decline isn't bad news in an airplane). Further, if we talk about the world of resources, we currently use a trivial fraction of the world's resources. By a conservative estimate, we have employed at most (including the soil we till for agriculture, extracted minerals, etc) less than 0.0001% of the earth's mass. In terms of energy, all energy (except nuclear) comes ultimately from the sun (fossil fuels, hydropower reservoirs, etc are just convenient storage repositories of the sun's energy). We currently use an infinitesimal percentage of the sun's energy. I wrote much more on the zero-sum wealth fallacy here. And here is my ancestor blogger in Coyote Broadsheet making the same fallacy as Mr. Tobis back in the 19th century, writing on the Peak Whale Theory. Just like actual 20th century data tends to undermine catastrophic climate forecasts, experience over the last century tends to contradict the notion that growth is devastating to the environment. We can find the best example right here in the environmental Satan called the USA. The US has cleaner air and water today than in any time in decades. Because of technology and growth, we can produce more food on less land than ever -- in fact the amount of land dedicated to agriculture has shrunk for years, allowing forests to steadily expand in the US for over eighty years (that is, until the environmentalists got the government to subsidize ethanol). No one in Brazil would be burning huge tracts of the Amazon if they enjoyed the agricultural productivity we do in the US. Sure, we have done some things that turn out to be environmentally bad (e.g. lead in gasoline) but our wealth has allowed us to fairly painlessly fix these mistakes, even if the fixes have not come as fast as environmentalists have desired. I will confess that the Chinese seem hell bent on messing up their air and water as much as possible, but, just like the United States, it will be the wealthy middle and upper class of China that will finally demand that things get cleaned up, and it will be their wealth, not their poverty, that allows them to do so. Similarly, I don't think CO2 reduction will do much of anything to improve our climate, but if we find it necessary, it will be through application of wealth, not squalor, that we overcome the problems. Here is a simple test: Which countries of the world have the worst environmental problems? Its is the poorest countries, not the wealthiest. For the sake of argument, let's assume that man-made global warming increases severed storm frequency by 20%, or by 3 or 4 extra hurricanes a year (why this probably is not happening). Even a point or two knocked off worldwide economic growth means hundreds of trillions of dollars in lost annual GDP a century from now (2% growth yields a world economy of $450 trillion in a century. 3% growth yields a world economy $1,150 trillion in a hundred years.) So, using these figures, would the world be better off with the current level of hurricanes, or would it be better off with four more hurricanes but $700 trillion a year more to deal with them. Hmmm. Remember, life lost in a hurricane correlates much higher with poverty in the area the hurricane hit rather than with storm strength, as demonstrated by recent cyclones in Asia. This general line of reasoning is usually described as warmer and richer vs. cooler and poorer. I cannot speak for Mr. Tobis, but many environmentalists find this kind of reasoning offensive. They believe that it is a sin for man to modify the earth at all, and that changing the climate in any way is wrong, even if man is not hurt substantially by this change. Of course, in climate, we have only been observing climate for 30-100 years, while climate goes through decadal, millennial, and even million-year cycles. So it is a bit hard to tell exactly what is natural for Gaia and what is not, but that does stop environmentalists from declaring that they know what is unnatural. I grew up in the deep South, and their position sounds exactly like a good fiery Baptist minister preaching on the sins of humanity. More from Jerry Taylor, who got Tobis started on his rant in the first place. Postscript: Here is an interesting chicken or the egg problem: Do you think Mr. Tobias learned about man-made global warming first, and then came to the conclusion that growth is bad? Or did Mr. Tobis previously believe that man needed to be fewer and poorer, and become enthusiastic about global warming theory as a clever packaging for ideas most of the world's population would reject? The answer to this question is a window on why 1) the socialists and anti-globalization folks have been so quiet lately (the have all jumped onto global warming); 2) no one in the global warming movement wants to debate the science any longer (because the point is not the science but the license to smack down the world economy) and 3) why so much of the Bali conference seems to be about wealth transfers than environmentalism. Let's forget all the other issues surrounding ethanol for a moment (we'll mention a really bad one below), and just consider one fact that is beyond dispute. Ethanol has an energy content per gallon that is only about 65% of that of gasoline. So, another way to put it is that it takes a bit over 1.5 gallons of ethanol to replace 1 gallon of gasoline. There is nothing suspicious or sinister about this (ethanol is flawed for other reasons) or at all controversial. "The number of plants under construction is truly frightening,"
capacity, in a few years, according to Groschen. You need to understand that you and everyone else are failing at simple math. In 2004 the US consumed just over 140 billion gallons of gasoline. So, already, our media has failed the math test. 12 billion gallons would be 8.6%, but we will give them a pass on rounding that to "roughly 10 percent." But this 8.6% only holds true if gasoline is replaced by ethanol 1:1. Using the actual figures cited above, 12 billion gallons of ethanol is about 7.8billion gallons an a gasoline equivalent, which would make it 5.6% of US gasoline usage in 2004, and probably an even smaller percentage if we were to take the worlds "gasoline capacity" at face value, since surely capacity is higher than production. I know it seems petty to pick on one paper, and probably would not be worth my time to bother if it was just this one article. But this mistake is made by every MSM article I have ever seen on ethanol. I can't remember any writer or editor ever getting it right. By the way, if you want more on what is wrong with ethanol, check my past posts. 10-year high, while the price of maize has doubled. will disappear by 2022, where heavy biofuel production is underway. life, and food self-sufficiency to grow fuel crops for export." feeling, can be the single most important aspect of an expressive act. emotional impact, by the intensity of the resonance it creates. intensity and richness of the feelings that attach her to her cause. audience to share their passion. sensitivity, will be the most valued and the most effective. Wow! This is fantastic, and aimed right at University speech codes that try to ban any speech that offends someone [a standard that tends to be enforced unevenly, typically entailing prosecuting only those students who offend people who are like-minded with the school's faculty and administration.